The Certified Medical Administrative Assistant with Certified Electronic Health Records Specialist plus Medical Terminology is an online program that will prepare you for a rewarding career in the healthcare industry. In this program, you will gain a wide range of medical office management skills that healthcare professionals need for a successful career in a medical setting. Upon completion of this program, you will be ready to take the Certified Medical Administrative Assistant (CMAA) and the Certified Electronic Health Records Specialist (CEHRS) national certification exams offered by National Healthcareer Association (NHA) and will receive the study guide materials, access to practice exams, and registration fees for both. When you enroll in this all-inclusive National Healthcareer Association (NHA)-certified program, you'll unlock the door to a burgeoning career. Certified Medical Administrative Assistant possess a broad scope of knowledge and skills that make them ideal professionals for any ambulatory care setting, including medical practices, urgent care centers, ambulatory surgery centers, hospital clinics, same-day surgery centers, and dialysis clinics. Employment is also available in medical laboratories, government agencies, and educational institutions. This program offers valuable training in medical office management, legal, ethical, and regulatory concepts, information on what is stored in an electronic health record (EHR) system, steps required to implement an electronic health record system in a medical practice, how staff members and patients interact with EHR systems, and what benefits these systems provide compared to traditional paper records. Upon completion of this program, you will be prepared to take the Certified Medical Administrative Assistant (CMAA) and the Electronic Health Record Specialist Certification (CEHRS) exams offered by National Healthcareer Association (NHA), and the cost of the exams is included in your tuition. Browser: The latest version of Google Chrome or Mozilla Firefox are preferred to access the classroom. Microsoft Edge and Safari are also compatible. Internet Explorer is required to access the electronic health record (EHR) software within the course. Note: Access to the electronic health record (EHR) software within the course is only accessible using Internet Explorer. Upon successful completion of the program, you will be awarded a certificate of completion. In addition, NHA Certified Medical Administrative Assistant (CMAA) and Certified Electronic Health Records Specialist (CEHRS) exam vouchers are provided to you in the format of a digital registration process to enroll for the exam after successful completion of the program and financial obligation. 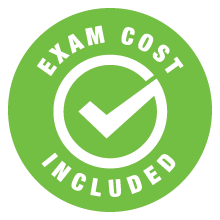 Yes, you will be prepared to sit for the Certified Medical Administrative Assistant (CMAA) and Certified Electronic Health Records Specialist (CEHRS) exams offered by National Healthcareer Association (NHA) and receive exam vouchers after successful completion of the program and financial obligation.